This view of the Earth from astronaut Michael Barratt's helmet camera in this June 5, 2009 spacewalk shows the blue planet below and the International Space Station's Russian segment. 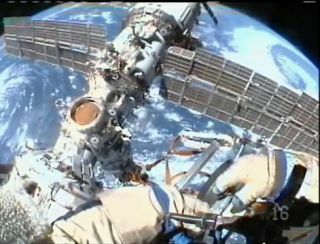 The rust-colored circle is a hatch that will be replaced in a June 10 spacewalk. Barratt was riding the end of the station's 50-foot Russian crane to get this view of the outpost.